We’re all digital hoarders, aren’t we? We have more photos on our computers than we could ever print. If you’re anything like me you have at least 10 years worth of digital documents, spreadsheets, and PDFs on your old computer. Good question. And, there are many different answers. In today’s Quick Tip Video Series I’ll show you an easy, step-by-step way to transfer your files from your old computer to your new trading computer. Today’s video was recorded on Windows 7. 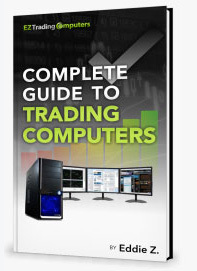 We recommend Windows 7 for traders. The basic process is the same on any computer and any operating system. Menus and locations may change depending on which operating system you’re using (Windows 8 for example). You’ll need to have an external hard drive handy to complete the steps below. Connect an external hard drive to your old computer. Click on Start. The Start Menu will appear. Click on “Computer” from the right portion of the Start Menu. Verify your external hard drive is connected. Identify your drive and its corresponding letter label in your “Computer” window (hard drives are usually labeled A, B, C, D, etc.). Find your pictures, videos, e-books, documents or whatever you choose to be copied from your old computer onto the external hard drive. With the files and folders you want to copy selected on your old computer, right-click on it and choose “copy” (the copy function is available on the gray contextual menu that appears after right clicking). Navigate back over to your external drive. Right-click on the drive itself. A gray contextual menu will appear. Click on “paste” from this gray menu. After selecting paste, you should now see all the folders or files that you copied from your old computer. You can repeat this same process to get all the files and folders that you want from your old computer onto the external drive. Once you’ve copied all of the folders and files that you want disconnect your external drive. Now you can take the external drive and connect it to your new computer (via USB or whatever connection type your external hard drive has). Repeat the process of copying from the external drive on to the new computer. One tip is that you can actually copy and paste multiple files by highlighting groups of files and folders. You can select them all the same time. After you’ve selected groups of files, right click and choose copy and paste that way we don’t have to repeat this for every little file and folder you want to copy. We hope today’s Quick Tip helped you.